Enjoy dynamic and powerful sound from a variety of sources with the LG CM9550 2800W Mini Shelf Speaker System. 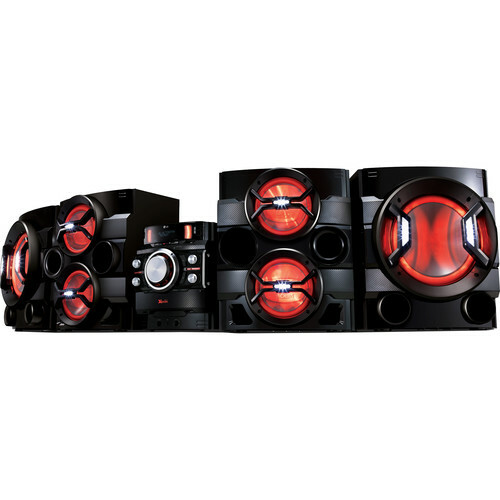 This speaker system delivers up to 2800W of total power and features two main speakers that incorporate a secondary speaker driver along with dual external subwoofers. Bluetooth is built-in for easy pairing and wireless music streaming from other Bluetooth-enabled devices like smartphones and tablets. The onboard Auto DJ feature allows you to enjoy a professional-quality audio experience. The LG CM9550 has dual USB ports that support playback from USB devices. For interfacing additional audio sources, this system is equipped with stereo RCA and 3.5mm audio inputs. The integrated FM tuner allows you to enjoy free over-the-air radio programming. There’s also a CD player built-in, which supports MP3- and WMA-encoded discs. Integrated Karaoke support allows you to sing along to your favorite tracks. This system also includes multiple sound effects for a customized listening experience. Auto DJ is designed to virtually eliminate the gaps between songs for seamless, continuous audio. Main Unit: 11.4" x 13.7" x 14.6"
Each Main Speaker/Secondary Speaker: 16.7" x 19.9" x 13.8"
Each Subwoofer: 16.7" x 19.9" x 13.9"